Aging is not always necessarily responsible for a person's memory loss. Short-term memory problems, in particular, can be caused by a number of other factors. What we eat and drink can definitely play a part. Therefore, knowing what foods to eat and what foods to avoid can contribute to brain health. Consuming adequate levels of certain nutrients helps to maintain healthy nerve cells, enhancing memory and slowing the progression of dementia. Low blood sugar can have detrimental effects on the brain. Loss of short-term memory is a common symptom. A research study published in a recent issue of the Journal of the American Medical Association (JAMA) suggests that older diabetics may be at increased risk for developing Alzheimer's disease or other dementias. The study found that the risk increases more with the severity of hypoglycemia. Individuals are advised to reduce sugar intake--and that includes consumption of artificial sweeteners. It may help to understand that the body quickly metabolizes foods that contain refined white sugar and bleached white flour. This causes blood sugar to spike, then drop. 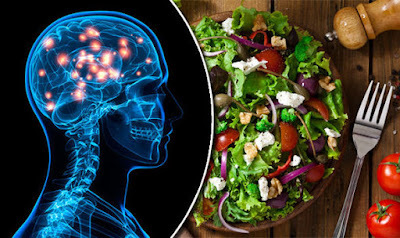 Because high glucose levels can damage brain cells, a healthier alternative for both mind and body is to eat more fresh fruits and vegetables, which are high-fiber carbohydrates. The body absorbs these carbohydrates better and raises blood glucose levels slowly. Limit consumption of alcohol, which acts as a depressant by slowing down reaction time and interfering with thought processes. Information recently published online by Brown University Health Services explains that women are more at risk than men for suffering the negative effects of drinking too much alcohol (see Reference 3). Because women have less body water than men, their ability to dilute the alcohol is diminished. A woman's body also metabolizes alcohol more slowly, resulting in blood alcohol levels that could be high enough to impair judgment and lead to mental confusion. For both men and women, drinking alcohol in excessive quantities can affect short-term memory. Foods not organically grown are often contaminated with insecticides or other pesticides that are toxic. These chemical substances can affect nerve function, causing brain damage and memory loss. Toxins in the environment that are passed on to humans through the air we breathe, the water we drink, and the food we eat have the potential to destroy brain cells. When mitochondria in cells are destroyed, the body's ability to produce adenosine triphosphate is destroyed as well. Adenosine triphosphate is the body's primary source of energy and is central to brain cognition and thought. The chemicals found in food preservatives, artificial colors and flavors, and other additives can accumulate in the body, causing eventual brain damage and memory loss. While these substances are used to make food look better and increase their shelf life, beware of foods with the word "enriched" on the label, as they likely do not have any higher nutritional value. Consuming too many soy products like tofu might actually increase the risk for memory loss, according to a study funded by the British Alzheimer's Research Trust (see Reference 4). Although soy is an alternative source of protein for many people throughout the world, if consumed in high enough quantities, the phytoestrogens contained in soy may increase the risk of dementia, especially in older individuals.